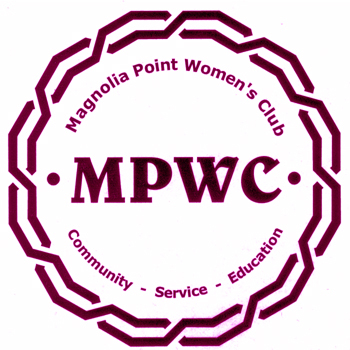 The meeting of the MPWC was called to order by the President, Nancy Nettuno at 3:00 pm. Nancy welcomed new members. Judy Williamson reported that we now have 183 members in our Club. Minutes of the November meeting were accepted. Nancy read the Treasurer’s Report. The Hospitality Committee has greeted 65 new people this year. Lexie Beaver is doing the new section by herself and would like volunteers to assist her. The Charity Committee has posted a form on the website. If there is a charity that you feel strongly about, please fill out the form and send to Helen Weygand by May 31st. Guidelines for the Committee are posted on the website. Donna Hicken will be speaking at a luncheon meeting in February. Since the Club can only accommodate 110 ladies for the luncheon, members will have first choice. If we are not filled, then guests will be accommodated. Barbara Szymanski reported on the Charles E. Bennett Fund. She thanked the ladies who shopped for Christmas. Since then, we have purchased clothes for a family who had nothing to wear to school. The social worker from CEB has praised our group, saying that she can always count on us to follow through. Barbara still has cookbooks for those new members who have not purchased them and will bring them to the meetings. It was proposed and approved that the Club transfer $1,000 to the CEB Fund. We have helped 74 people this year and 10 families last year. The Fundraising Committee is talking about ideas for a Spring fundraiser and will report in March. Please give any ideas to Dorothy Wood or Sharon Sprott. Thresa Oliverio reported that she will be contacting the Committee members around the 13th of January. If you are interested in serving on this Committee, contact Thresa. As an aside, Thresa said that the $3,000 that we offer in scholarships is as much or more than many Clubs offer who have been around for many years longer than ours. Sue Dake reported that we had a very successful Luminaries Night this year. She thanked the block captains, assemblers and co-chairs Helen Weygand and Mary Margaret Wyzkoski. She also reported that we will have to have an alternative way to put out sales information next year as we will no longer be able to put the information in mailboxes. Some residents forgot about picking up their kits and there was lots of delivering needed. We need another way to approach this. Also, a lot of new residents did not participate, so we need ideas on how to improve communications. The Book Club will meet at Barbara Long’s home on the last Wednesday of January. Bring lunch, dessert will be provided. Bev Jones reported on Sunshine activities. Kathie Cardon is heading up a new Committee called Helping Hands, which is an extension of the Sunshine Committee. So far she has 29 volunteers. The Committee provides services such as taking food to families who have had a loss or are ill, providing needed transportation, etc. Habitat for Hamanity needs someone interested in leading that effort in our community. This would involve working on Habitat homes in Green Cove Springs once a month. Barbara Long is heading the pillow making group for Mended Hearts. She has the pattern and directions for those interested. Also donations of materials would be appreciated. The Gourmet Club will hold their kick-off cocktail party on Sunday night at Donna Medara’s house. A message will be sent out. The meeting was adjourned at 3:40 pm, followed by a program by Dr. John Verville.